Saudi Arabia has said its military coalition will scale back operations against rebels in Yemen. The US-backed coalition of mostly Arab states began air strikes a year ago in support of Yemen's internationally recognised government. A Saudi military spokesman said that the coalition would continue to provide air support to Yemeni forces. The announcement came as the death toll from a strike on a market this week doubled to more than 100. Witnesses said at least two missiles hit the busy market in the Mustaba district of Hajja province, north of the capital Sanaa, an area controlled by the Shia Houthi rebels. Video footage purportedly of the aftermath of the strike showed what appeared to be the bodies of several children. A UN official said 22 children were among those killed. In January, a UN panel found that coalition air strikes had targeted civilians in Yemen and assessed that some attacks might constitute crimes against humanity. 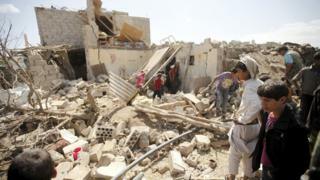 The Houthi rebels are fighting forces loyal to exiled President Abdrabbuh Mansour Hadi. The fighting has killed more than 6,200 people, displaced millions and pushed the Arab world's poorest country to the brink of famine. Saudi military spokesman Brigadier General Ahmed al-Asiri told the Associated Press that the coalition would continue to provide air support to Yemeni forces battling the Houthis. "The aim of the coalition is to create a strong cohesive government with a strong national army and security forces that can combat terrorism and impose law and order across the country," Mr al-Asiri said. Only "small" teams of coalition troops would remain on the ground to "equip, train, and advise" Yemeni forces, which are gradually replacing coalition forces, he said. The attack on the market in Hajja province was the second deadliest in Yemen since the Saudi-led air strikes began, after an air strike hit a wedding party in September, killing at least 131 people. Mr Al-Asiri said the coalition was investigating the attack, arguing that Tuesday's airstrikes targeted a "gathering area" for Houthi fighters, located about 10km (six miles) away from the market. UN Secretary General Ban Ki-moon condemned the strike. He said: "Attacks directed against civilians and civilian objects, including populated markets, are strictly prohibited." On Wednesday, Jamie McGoldrick, the UN's humanitarian chief in Yemen, said none of the warring parties in Yemen were fulfilling their obligations to protect civilians or facilitate humanitarian assistance. The war has left Yemen fragmented and facing a humanitarian crisis. Militants from the so-called Islamic State group have also taken advantage of the chaos to wage a series of deadly attacks across the country.